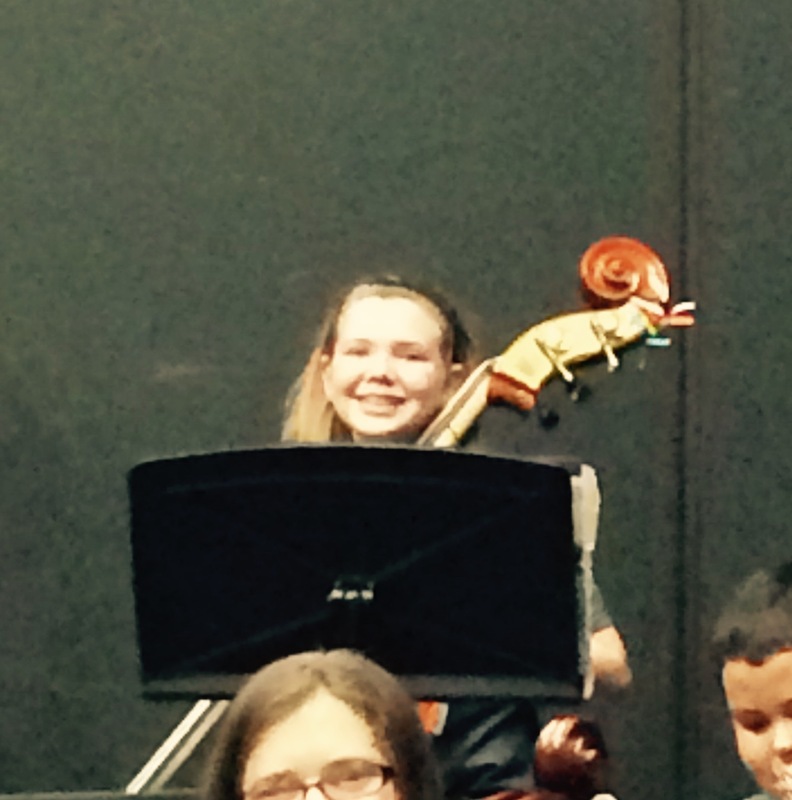 Embug participated in her first Christmas Orchestra Concert. 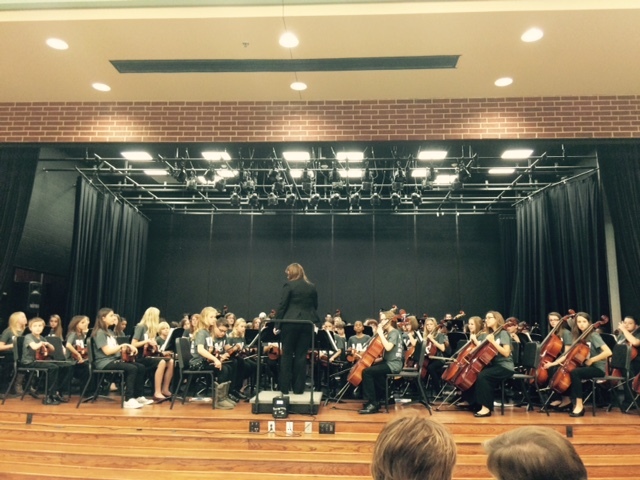 There was huge improvement with the 6th grade orchestras as a whole since their fall performance just 7 weeks earlier. They played a series of ten 30 to 60 second arrangements. I captured them on video but that will stay in the family archives, as I believe only a parent can appreciate the performance. It was also difficult to capture a shot of her with her bass, as we all know the bass section is always at the back of the orchestra pit. Of course we are proud of our amazing FIRST Chair Bass Player (Yes! First chair!). 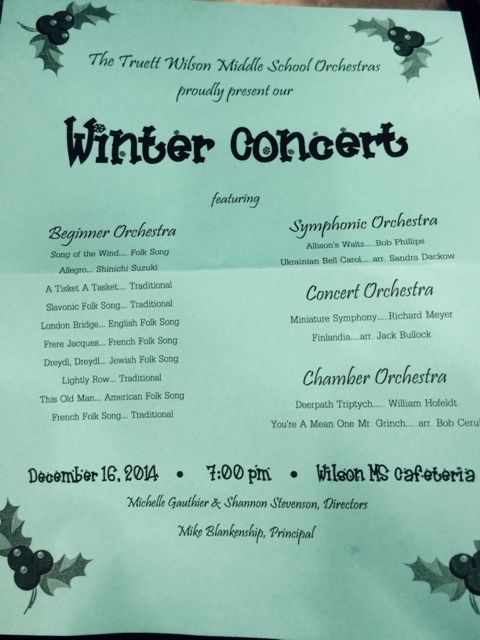 The same week as the Christmas Orchestra Concert was the Wilson Middle School Talent Show. Unlike in previous years there were tryouts where not everybody made it. We were very honored when Embug was one of the sixth graders selected. She was in charge of this project from beginning to end. She selected her song and accompaniment soundtrack… “We Need a Little Christmas,” planned and rehearsed her own choreography, and chose her “flashy” Christmas sweater and metallic leggings (that look flesh colored in the video). She had two performances on the last day before the holiday break that resulted in her singing in front of the entire student body by the end of the day. I took her brother out of school for the first performance mid-morning so we could watch her, then returned him to school for his Christmas party. Eric came for the afternoon performance. Here is a less than professional recording job, compliments of my iPhone. Unfortunately, the video also does a poor job of capturing her facial expressions as she sang, which made the song all the more entertaining. Practically speaking, I should not go and buy expensive recording equipment or cameras to capture all these events, but part of me wonders if I should. Either way, the moment has been captured and this is just enough for me, Eric and Kritterman to remember how it was in person. Pure joy!